This article describes how to move Control to a new server. This only applies to a standard Control configuration: 1 database, 1 SSLIP. What version of Control is installed on the existing server? In Control, go to the Help menu at the top of the screen and click About Control to find the version. Alternatively, you can right-click on the Control.exe file and choose Properties, then look at the Details tab to get the version. You want to install the same version of Control onto the new server. While it may seem advantageous to use the server swap as an opportunity to upgrade Control, it's best to avoid doing this. Upgrade Control before or after the server swap. What version of SQL Server is installed on the existing server? Is it SQL Express or a paid version such as SQL Standard or Enterprise? You want to install the same version of SQL Server on the new server, or a newer version. A full Control installation on the new server will install SQL Server Express. This is the recommended way to install SQL Server as the instance will be automatically configured for you. The installer for Control 4.6 includes SQL 2008 R2, while the installer for the current version of Control 5.6 contains SQL 2012. If a paid version of SQL Server is getting installed on the new server, that should be installed before Control by following steps 4 and 5 from this article: Control 5.1 Manual Installation#x-Explanation-Step%204%20-%20SQL%20Server. Are there any custom reports? If so, they must be moved to the new server. If you are using Control 4.6 or earlier, first upgrade Control to the latest version, then follow the instructions from the above link. Ensure you are able to log into Control on the new server before proceeding. You will need to shut down the SSLIP on the existing server before you can run it on the new server. On the old server, launch SQL Server Management Studio. Log into the local SQL instance that hosts your Control database (it is usually called Cyrious). You should be able to log in using Windows Authentication. In the backup window, remove any existing files listed in the destination box, then add a destination path and file for your backup. It's best to use the .bak extension for the backup. Click OK and wait for the backup to complete. Transfer the backup file created above to your new server PC. Log into the local SQL instance used for Control (usually called Cyrious). You should be able to log in using Windows Authentication. Right-click on StoreData and choose Delete. Click OK in the window that pops up to delete the database. In the Source section, choose Device, then click the button to the right to select your .bak file. Click on Files on the left and ensure both of the files get restored to the Control program folder (usually C:\Program Files (x86)\Cyrious\Control). The data file should be named StoreData.mdf and the log file should be named StoreData.ldf. Click OK to restore the backup. If there were any custom reports, move them to the new server. They should get placed in a Reports folder within the Control program folder (typically C:\Program Files (x86)\Cyrious\Control). If the Reports folder doesn't exist yet, create it. Put all the report files into the Reports folder. If they are using Document Management, this will need to be adjusted. If migrating files to a location on the new server, don't forget these. Important! - Be sure SSLIP, CHAPI, HomeGate and CDAS are all shut down and disabled on the old server before starting them on the new server. On the new server, run SSLIP.exe. Once the SSLIP starts, verify you can log into Control. You should see the familiar list of users in the login drop-down box as the data has now been restored on the new server. Do not proceed until you can log into Control successfully on the new server and you can see that you have the data that was backed up from the old server. On the old server, go to Control Panel > Programs and Features and uninstall Cyrious Control. 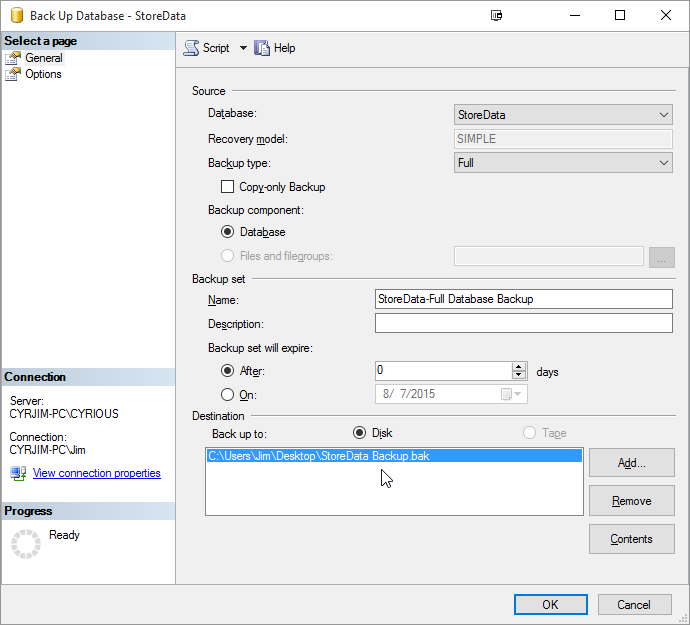 If SQL Server will no longer be used on the old server, go to SQL Server Configuration Manager and set the SQL instance startup type to Disabled. A customer that had our shipping module will need that repathed to the new server. A customer using Production Terminal would need that set up on the new server as well. Right-click the Control shortcut and select Properties. The servername part will be the name of the old server. Change it to the name of the new server. For instance, if the new server's name is CyriousServer, the full path should be \\CyriousServer\cyrious$\Control\Control.exe. Verify you can log into Control from the client PCs.